חברת הלווינים הצרפתית Eutelsat Communications הודיע העל חתימת חוזה חדש עם חברת Numeo אשר תציע מעתה את שירותי האינטרנט בפס רחב לוויני של Eutelsat המשווקים תחת המותג Tooway לאזורים חקלאיים דלילי אוכלוסין ברחבי צרפת. Eutelsat Communications signed a deal to boost its satellite broadband prospects in France, as Numeo S.A will distribute Eutelsat’s Tooway satellite broadband service in rural areas of the country, Eutelsat announced Sept. 25. Numeo, a provider of Internet services for rural areas, has been marketing wireless broadband access solutions for underserved areas since 2004 and commercializes the offers of Public Initiative Networks in more than 30 French departments. 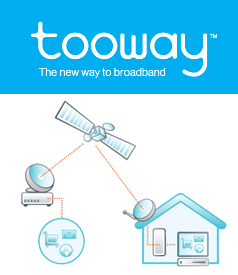 The company is expanding its portfolio of broadband solutions with the Tooway satellite broadband service, which it will offer for as low as 29.90 euros ($43.88) per month.